The latest Pearls collection is now in stores. It’s called “When Pigs Fly.” You can get it at your local bookstore or right HERE. The intro is about a very important topic, namely, which cartoonists I can beat up and which I can’t. Like all collections, it contains around 9 months worth of strips, but unlike other collections, it includes 11 strips that were never published in newspapers. They’re from the early days of the strip when it was internet-only. And let me just say this — Those 11 strips are so bad they almost cross over into good. Not long ago, the deli in my grocery store put mayonnaise on the sandwich that I asked for with no mayonnaise. The next week they left the turkey off a turkey sandwich. That’s an item most turkey sandwiches include. Yesterday, they topped even themselves. They failed to make the sandwich entirely. That’s a weird thing about a sandwich order. You need to remember the sandwich. I now see that with each mistake, I’m going to get less and less. Which means the next thing they will do is come to my house and remove the food from my refrigerator. The reason this keeps happening is that they keep getting new employees and I don’t know them. So I don’t know which ones will screw up my sandwich. Worse, I can’t remember who screwed up the last time. Thus, I’ve decided to steal an idea from the Boy Scouts. They award merit badges to people who accomplish things. I will do the opposite. I will award badges to people who fail to accomplish things. Think of it as a merit badge in reverse. I’m going to have thousands of them made into stickers. And when someone around me does something not just stupid, but stoopid, I will peel off one of these stickers and affix it to their shirt. 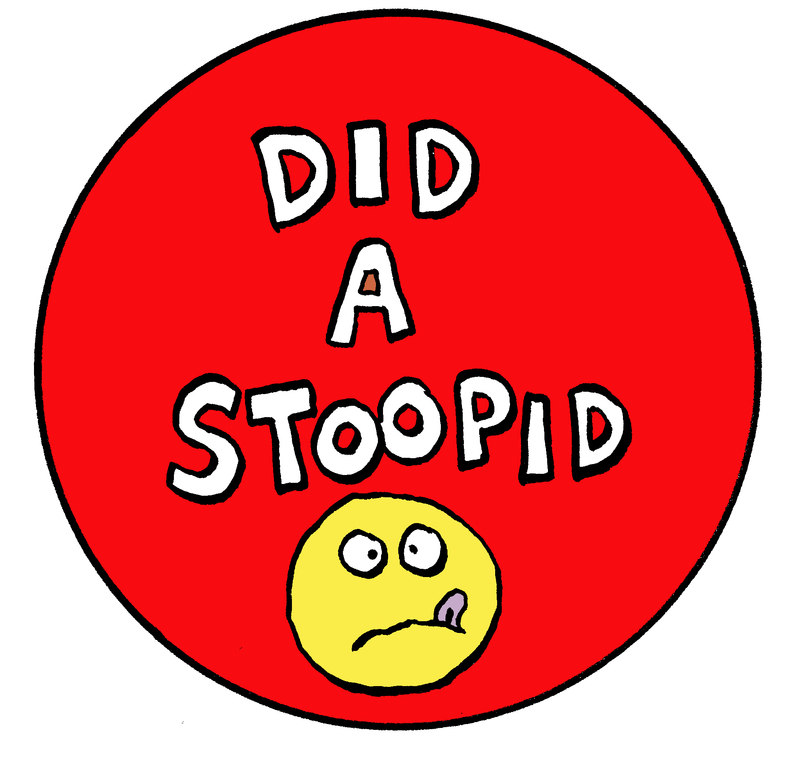 The stoopidest among us will have more Stoopid Badges than a TGI Friday’s employee has chotchkies. This will allow us to instantly recognize those among us who are dangerously inept. And there will be gradations of how much stoopid you can tolerate. While three on your gardener is probably okay, three on your barber is not. Nor is two on your airplane pilot. Nor one on your brain surgeon. On the flip side, all human beings will have a maximum tolerance of twelve. A Twelver, as they will be called, should not be allowed to brush lint from your shoulder. They could take out an eye. So feel free to put one of these on that special someone in your life. Just don’t put any on me. I invented the damn things. Plus, my mistakes have a reason. Because my sandwich came without a sandwich. I just finished reading two plays by the Russian writer Anton Chekhov. In the first one, the main character shoots himself in the head in the last line of the play. In the second one, the main character shoots himself in the head in the last line of the play. I thought maybe I’d read the same play twice. But I hadn’t. I checked the titles. They were different. I can’t help thinking of the conversations Anton Chekhov used to have with his editor. “I have a new play,” Chekhov says. “What about?” asks his editor. Despite all this, Anton Chekhov is now known as the greatest Russian playwright who ever lived. Because I have to imagine he influenced every Russian playwright to follow, some of whom may not have wanted to shoot their main character in the head, but felt compelled. If I ever meet a Russian, I’m going to let him know that not all entertainment needs to end that way. And I’m giving away my book of Anton Chekhov plays despite the fact that I have not read the last play in the book. It’s called, “Uncle Vanya.” And I have a strong feeling he’s now deceased. And that the word “Boom” is somewhere in there. All this made me look up Anton Chekhov to see how he, the playwright whose every character dramatically shot themselves in the head, ended his own life. Care to guess? 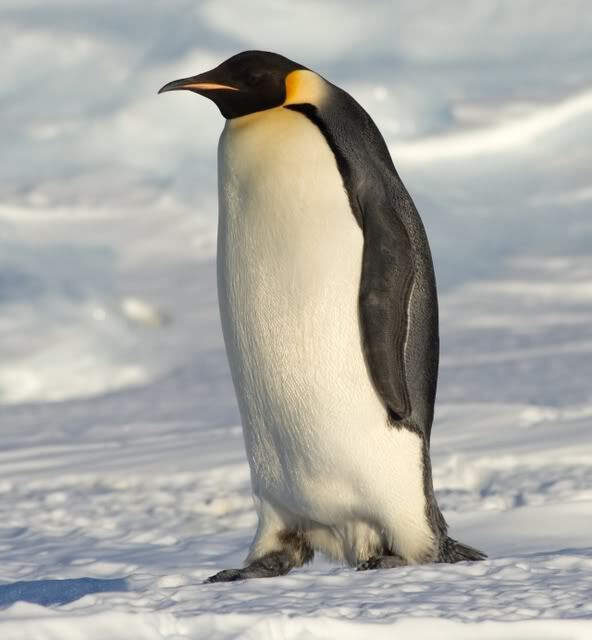 If you had to (A) spend the rest of your life on a desert island with all the supplies you’d ever need but absolutely no other people around, or (B) keep your life as you have it now but carry an emperor penguin under each arm forevermore, which would you choose? My first contact with the creator of “Cathy” was a phone call. “I know who you are,” replied Cathy Guisewite. It’s the kind of greeting a Nazi hunter would give to Josef Mengele when he found him hiding behind a South American palm tree. I suppose I should give you some back story. Better yet, I’ll show it to you. You see, when I first came out of the gates as a young cartoonist, I was throwing more stones than a mob of Palestinian children. And most of them were at my fellow cartoonists. And I didn’t just lob one. There are many more also, but they’d fill the entire blog, so I’ll just leave it at that. “No, you’re not,” she said. “I don’t want you to do that,” she said. “Who are you gonna ask?” I said, pushing my luck. “Well, now that’s not a very fair jury,” I said. Protest aside, we ended the call, and the next day she called back to say that no one in her circle of jurors wanted me to run the strip. So I pulled it. I always thought that Cathy’s refusal to let me run the strip was in payback for what I had done earlier. But she never said that. In fact, other than not letting me run this particular strip, she never fired back at me in any way. She never said a word. Well, that’s not true. She did say one thing. 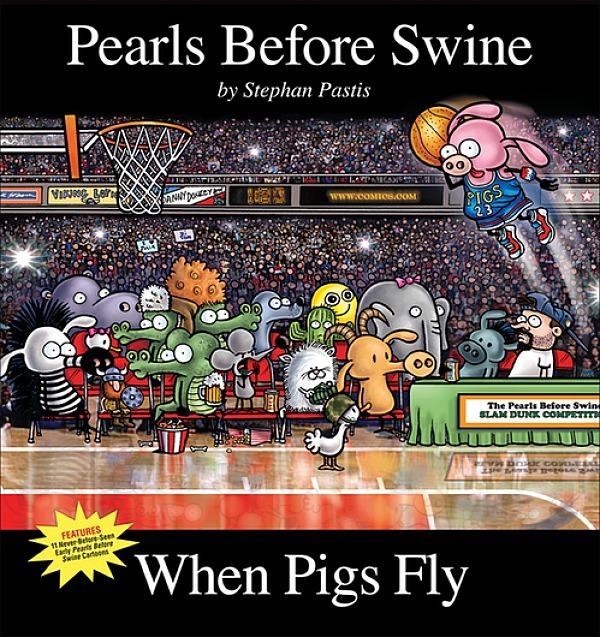 In May, 2004, Pearls was nominated by the National Cartoonists Society for Best Comic Strip. The presenter of the award was none other than Cathy Guisewite. I had never actually met her face-to-face and knew that if I were to win the award, she would undoubtedly say something to me. Sure enough, I won and went onstage to get the award from her. There was no way for her to say anything at that point, because the band was playing and I had to give a speech and all, but after that, it’s tradition for the presenter and winner to go off to the side of the stage while people take photos of you together. This would be her big chance to let me have it. To ream me for the meanness of my prior strips. And sure enough, as the flashbulbs were popping, she leaned in to say something. Funny how a little comment like that can teach you more about grace and class than an hour-long lecture. So good luck to you, Cathy. Enjoy your retirement. Squeezed a bunch of toothpaste out of the tube this morning to see if the adage, “You can’t put the toothpaste back in the tube” is right. Staci walked in as I was doing it. I had toothpaste on all of my fingers. When she wants to imply I’m someone she never should have married, she throws in the words “do you think”. I’ve come to learn over the years that there is no need to answer the questions with “do you think” in the middle. So I just stood there with toothpaste on my hands and watched as she put a big package of toilet paper in the cabinet under the sink. That’s when it caught my eye. On the package of toilet paper was a baby sitting in the clouds. “Why does our toilet paper have a picture of a baby in the clouds?” I asked Staci. “Why does it matter?” she said. “Because babies are cute and lovable,” I said. “Does that mean my toilet paper baby died?” I asked. “Wash the toothpaste off your hands,” she said. “Am I the only one bothered by this?” I asked. “Wash your hands,” she said. I stood there pondering how this unfortunate baby had started my whole day off on the wrong foot. “Stephan, seriously,” she said, grabbing me by the wrists and putting my hands under the hot water tap. I said the only thing I could.